Those of you that follow me on Facebook and Twitter will most likely know how much of a fan I am of JD’s Grill. This fantastic restaurant in Plymouth serves a range of burgers and steaks and also label gluten free options in their menu. They have been working hard since my original review to increase the amount of gluten free choices on their menu, and now have gluten free options available for all starters and mains as standard. They also have a good selection of desserts and often have been kind enough to get me a gluten free beer in too. The food served is right up my street and I am a regular visitor. The picture below shows me enjoying the Hoofs and Trotters burger, a half pound beef burger topped with cheese and pulled pork on a gluten free bun. What more could you ask for, other than gluten free fries which they now serve too. As you can see this Pleases me! As part of my work for the Coeliac UK Plymouth Group, we have been looking to organise a meal out for members. We struck upon the idea of having a meal during Coeliac Awareness week, and the meal will take place on Monday 12th May. This gives us an opportunity to get some publicity for the event which can help us raise awareness. JD’s Grill 110 capacity means we can throw the event open to non-members too, so I would like to invite Gluten Free by the Sea readers to join us. 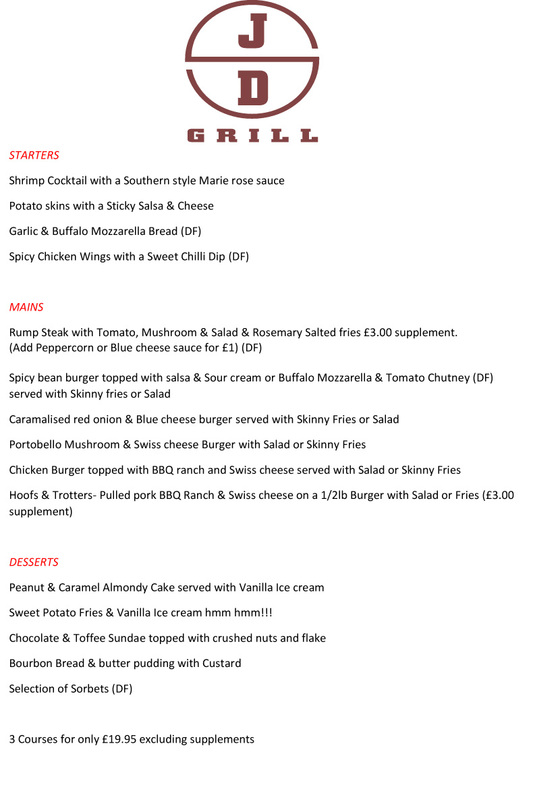 As you will see below JD’s Grill have provided a fantastic menu for the night, which is completely gluten free. So please come along and enjoy a night of amazing gluten free food and the chance to chat and share tips with gluten free friends. You will also be able to enjoy a gluten free beer too! You can see the Facebook page for the event here. For full details and booking information please see the details below, I hope to see you there. The Coeliac UK Plymouth Group, JD’s Grill and Gluten Free by the Sea invite you to join us for a night of fabulous gluten free food amongst the company of gluten free friends on Monday May 12th at JD’s Grill. JD’s Grill already offer a brilliant selection of gluten free dishes on their menu, with clearly marked gluten free options. Furthermore they have kindly agreed to host a gluten free night in the restaurant as part of Coeliac UK’s Coeliac Awareness week, which this year runs from May 12th – 18th. All choices on the above menu are gluten free. Please let us know if you have any other dietary requirements when booking. We are aware that many of you also need to follow a dairy free diet, so JD’s have kindly marked the dairy free options on the menu. Please note some of the dairy free choices use buffalo mozzarella (as opposed to mozzarella made with cows milk), so please bare this in mind when making your choice. You can find JD’s Grill at 17 Derrys Cross, Plymouth, PL1 2SW. We ask people to arrive from 7pm with the first course being served at 7:30 sharp. 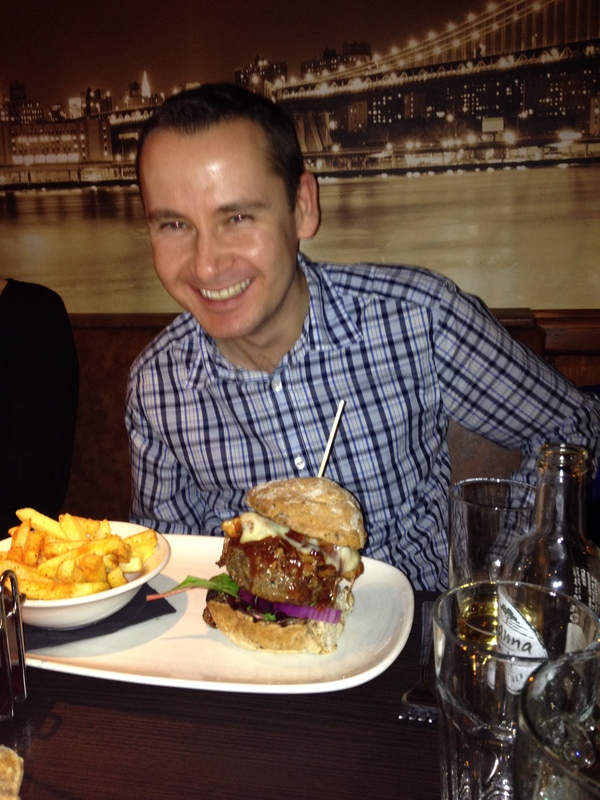 A big thank you to JD’s Grill for hosting us and helping us to raise awareness of Coeliac Disease. If you would like to enjoy this menu on the 12th but have your own table rather than join the Coeliac UK Plymouth Group party, please contact JD’s Grill directly on 01752 601605 to make your booking. 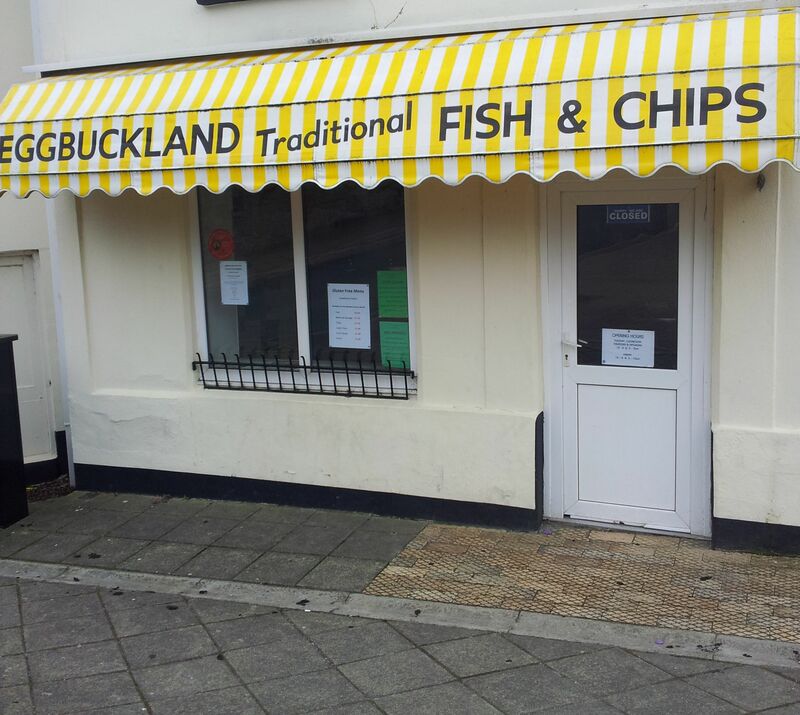 Update 31/08/14: Unfortunately Eggbuckland Fish and Chip Shop is now under new ownership and is no longer serving gluten free. 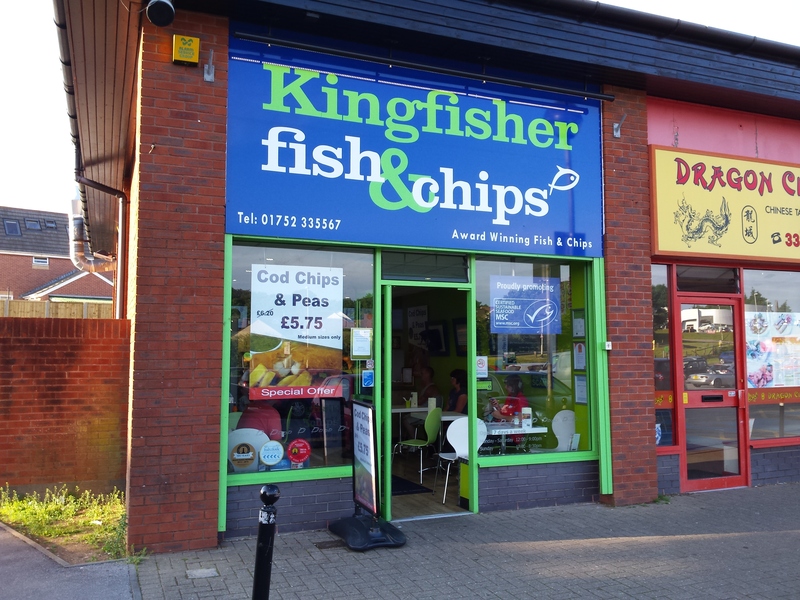 See Kingfisher Fish and Chip Shop review for an alternative option. Gluten Free by the Sea recently brought you news that Eggbuckland Fish and Chip shop in Plymouth were having a gluten free night the first Monday of every month. It was pleasing to see owner Johanna Haimes had received training from Coeliac UK and that the fryers would be completely steam cleaned, fresh oil used and only gluten free items cooked on the night. For more information see their press release. With confidence I made the trip to Eggbuckland village to try it out. When I arrived I could only just fit in the shop, it was extremely busy which was great to see. It was immediately apparent that there was a really lovely atmosphere within the shop. 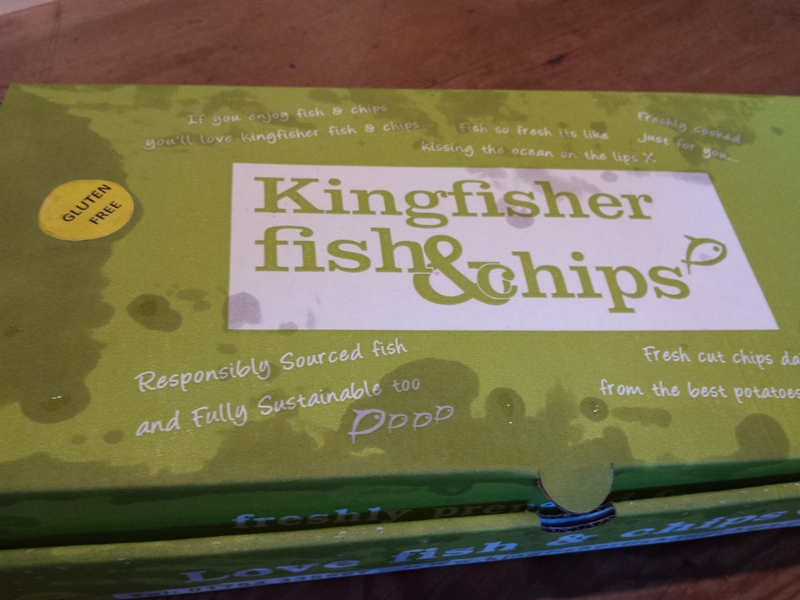 Staff and customers were exchanging stories about their excitement to tuck in to gluten free fish and chips. There was a young coeliac child who was about to have fish and chips for the first time, heart-warming. It was good to see Coeliac UK literature and certification, along with labelling from the gluten free products used on display in the shop, and this certainly added to my confidence. 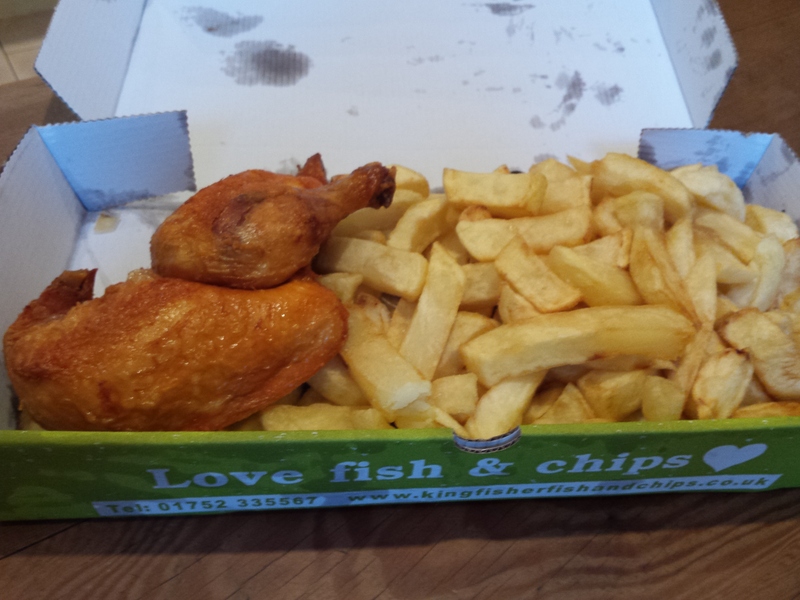 The choices were chips, battered fish, battered sausage, gravy and curry sauce. Johanna is looking to expand this range and is planning to add mushy peas, chicken and chicken nuggets to the menu for the next gluten free night on Easter Monday (open as normal). It was personally quite a nostalgic trip for me. Not only was this my first trip to a chippy since my coeliac journey began nearly two years ago, but I was brought up in Eggbuckland so this was my local chippy as a youngster. This was my first trip back since I moved away from Eggbuckland over ten years ago. I don’t eat fish, so I was very pleased to see the battered sausage on the menu. 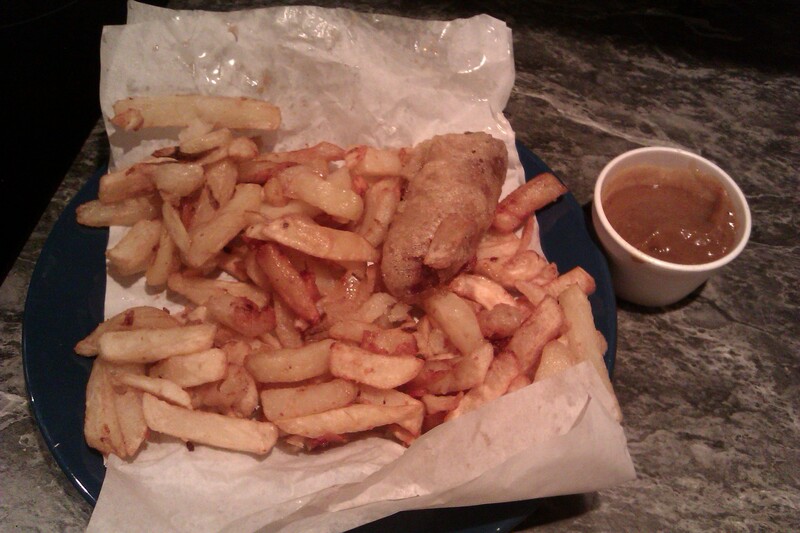 I ordered a large portion of chips and a battered sausage, with a side of curry sauce. I rushed home to dish up, and as I did I looked at the portion and thought that I’d never be able to eat it all. Truth be told I demolished the whole thing, probably without even stopping for breath. The sausage was tasty, the batter was light and crispy and very impressive. It was so good to have “proper” chips from a chippy again, I loved it! I am away on Easter Monday, but will definitely be going back for more. The evening itself was a great success, Johanna said “I was very surprised at the amount of children that came. It’s very sad that it has such an effect on the whole family. We were very happy that the hard work and research gave people with gluten intolerance the chance to enjoy something that most of us take for granted.” For some more quotes from Johanna on the night see this report from The Herald. Finally, a big thank you from me. I really enjoyed my meal and am looking forward to the next time. Thanks for putting these nights on, evening like this really make a difference.